Amazon.com description: Product Description: American society is being torn apart by the rise of new sources of news that have no respect for facts or democracy. Coupled with politicians who cast honest journalists as frauds and enemies of the public, they are destroying the informational commons and poisoning the process of reaching consensus that democracy requires. Public trust in professional journalism has fallen to the lowest point since polls began to measure confidence in the news. That makes us prey for unscrupulous media actors who whip up resentment and hatred of fellow Americans with false and distorted news reports that are widely believed. Because each group now has its own set of âfacts,â disputes cannot be resolved logically. We are becoming a nation of warring tribes, even to the point where we no longer wish to associate with each other. As a consequence, lawmakers no longer agree on what's real, much less what to do about it. Congress can no more plot a safe course forward than a squirrel caught in traffic. The only solution that respects freedom of speech and press is to equip all citizens with some basic tools â habits of mind â allowing them to discern truth from falsehood in this confusing new information environment. It's vital that we learn to critically assess news and information because in a democracy a misinformed vote counts as much as a wise one. This book examines the causes of our divisions and presents a method â the SMELL test â for separating honest journalism from fake and misleading news. 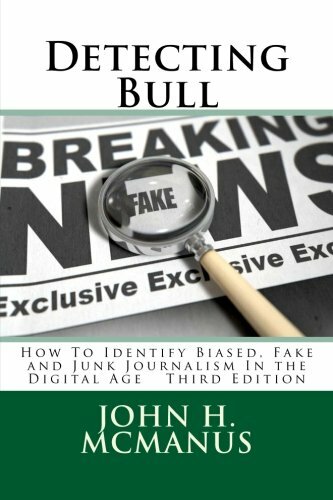 The first edition of Detecting Bull won the Society of Professional Journalists Research Prize in 2009. The author won the same research award in 1994 for Market-Driven Journalism: Let the Citizen Beware? Earlier editions of Detecting Bull have been adopted by universities across the U.S. and in Europe. In addition to the SMELL test for distinguishing reliable news and information from the rest, this book addresses: * The current revolution in communication causing so much turmoil in American politics; * The nature of truth; * Where bias comes from; * The covert bias of news organizations; * Theories of news selection relevant to the 21st century; * Realistic standards for judging news; * How to "read" photos and videos; * Common tricks of spinmeisters and fraudsters; * How to use the full power of the Web to penetrate fake and junk journalism; * How to evaluate the quality of news in any medium. This book will equip you and your students with a BS (Bald Sophistry) meter.